On Halloween, I had a lot of trick-or-treaters visit my home, but one small group of teenage girls was especially memorable. Sure, their Anime costumes were fabulous, but mostly what stood out was their cause. These teens weren’t trick-or-treating for candy, but for donations to support the United Nations Children’s Fund. This group of young humanitarians reminded me that even the smallest action can make a difference. Especially in a world where so many people lack food, clean water, and shelter. Trick-or-Treat for UNICEF is an annual campaign to raise funds for projects around the world. UNICEF works on water and sanitation projects in over 90 countries. It’s not to late for you to give either this holiday season. If you are interested in water issues, be sure and check out Universal GIVING. If you search with the keyword ‘water‘, you will find almost 300 different water projects looking for donations. Organizations represented on this site include Action Against Hunger, Green Empowerment, The Hope Alliance, International Medical Corps, and H20 Africa Foundation, to name a few. How would you like to give a few of these gifts this holiday season? We’re back again with more great Public Service Announcements (PSAs) relating to water for the PSA-a-thon Series. The first two PSAs featured (on rainwater harvesting and the Tap Project) were great. But the third batch in the series is pretty fun, as well. Today’s PSAs were created by Sukle Advertising + Design for a Denver, Colorado water conservation campaign. As an added bonus, here is another one of Sukle’s clever ways to teach people to conserve water. And another about, ummm, drinking water. Yes, it’s true. I am a sucker for any great Public Service Announcement (PSA) relating to water. If produced right, sometimes these PSAs have the ability to intrigue me, bring a smile to my face, educate me, and move me to action or even to tears. Because I love PSAs about water so much, I am going to feature them on Water for the Ages in a PSA-a-thon Series. Be sure and check out the first in the series: a PSA on rainwater harvesting made for television in India. The second in the series, today’s PSA, is a little out-of-date but neat nonetheless. It was created for the Tap Project, an outreach effort each year from March 16 to March 22, to raise money for UNICEF’s water programs. Enjoy. 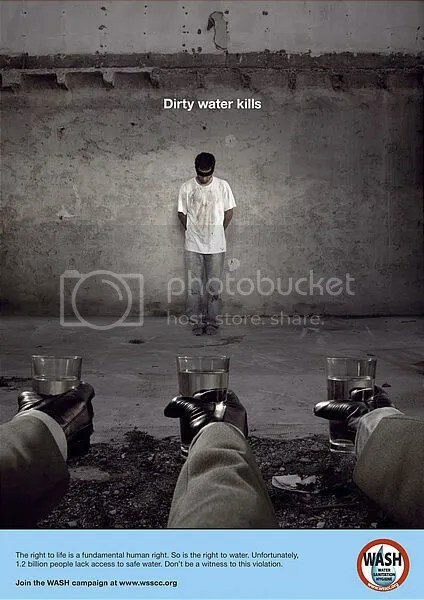 Advertising that will raise awareness of the global water crisis while raising money for UNICEF’s campaign to provide clean drinking water to children in developing countries, sounds better than consumerism to me. The second annual Tap Project ad blitz will soon arrive in papers and magazines of over twelve US cities including New York City, Boston Chicago, Cincinnati, Dallas, Los Angeles, Milwaukee, New Orleans, Portland, OR, Richmond, VA, San Diego, San Francisco, Seattle, and several cities in South Carolina, as stated in the New York Times today. Several notable advertising agencies will be producing the outreach material pro bono. Posters, ads, lapel pins, etc. will highlight fund-raising to begin Sunday, March 16th through Saturday, March 22th. 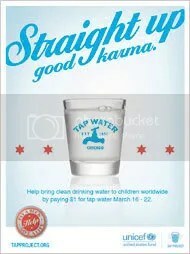 Participating restaurants will invite customers to donate a minimum of a dollar for tap water normally free. As the Tap Project web-site states, “For every dollar raised, a child will have clean drinking water for 40 days” through UNICEF project implementation. The project is set to coincide with World Water Day on March 22, 2008, an annual event promoted by the UN to promote public awareness of global water issues.